All photos by Cary Groner, courtesy of the Southern Arizona Limb Salvage Alliance. Diabetic foot ulcers present clinicians with a host of daunting challenges. Roughly 170 million people worldwide have diabetes and, of those, 15% will develop a foot ulcer at some point.1,2 Yet, despite the array of methodologies available to heal such wounds, the outcomes of one of the most fundamental practices—debridement—have never been studied closely in randomized clinical trials. Many physicians wish debridement protocols were bolstered by better research. The rationale for the practice appears so sensible that no one is seriously suggesting it be abandoned pending better evidence; clinicians, however, would prefer to be able to back up their opinions with stronger documentation, particularly when choosing among approaches. The rationale for surgical debridement—the longtime standard of care—is simple enough: to convert a chronic, nonhealing wound into an acute wound that stands a better chance of healing.3 A scalpel is used to remove nonvital tissue and other contaminants from the bed and edge of the wound; this may include hyperkeratotic epidermis and necrotic dermal tissue, debris, and bacteria. And, despite the lack of robust outcome studies, research has established the biological and molecular basis for debridement fairly well. For example, studies have shown that at the edges of chronic wounds, skin cells known as keratinocytes and fibroblasts exhibit a pathogenic phenotype that slows their migratory capacity and limits their ability to heal the wound.3 They form what is essentially callus, in other words, and debridement aims to clear away such cells so that those more receptive to healing signals and topical agents can proliferate, migrate, and respond to treatment. Robert Kirsner, MD, PhD, doesn’t deny that debridement seems to offer benefits. Kirsner, who is professor, vice chairman, Stiefel Laboratories chair, and chief of dermatology at the University of Miami Hospital and the associated Miller School of Medicine, would simply like to see better evidence of outcomes. But as Kirsner and his colleagues pointed out, the Steed paper was a post-hoc analysis of a trial in which debridement was studied secondarily. Among other issues, they noted, wound care centers that debrided more frequently may simply have provided better overall care independent of debridement. Kirsner similarly questioned the arguments for debridement made in the other studies examined in his paper.6-9 Although most clinicians agree that they’d like better evidence, they’re also realistic about the chances of getting it. Given that state of affairs, most clinicians do what Armstrong does—use their best judgment as to what methods of debridement seem appropriate for which patients. To Armstrong and many others, this means appropriate debridement of nonviable tissue. “When you do that in noninfected wounds with appropriate blood flow, the majority should heal. Whether that’s predictable or not depends largely on other circumstances, such as infection and ischemia,” he said. Kirsner himself is an advocate, as it happens. Stephanie Wu, DPM, MSc, notes that as tools and techniques have expanded, debridement has become a catch-all term that may refer to a number of approaches. In an article currently in press, Wu discusses causes of wound chronicity and approaches to debridement.13 As noted above, cells in the wound base and periphery undergo changes that impair their ability to participate in the healing process. Beyond that, however, the environment and inflammatory response of a chronic wound differ from those in an acute wound; changes in protease regulation, cytokine release, fibroblast morphology, and extracellular matrix composition may impair healing and macrophage function. Given the complexity of this deleterious biochemical cascade, it becomes especially important to identify the reasons a wound has become stagnant—whether related to peripheral vascular disease, malnutrition, infection, or other pathologies. Debridement nevertheless remains a mainstay of treatment, Wu believes, regardless of how it is approached. In her article, Wu described several innovative debridement methods of which clinicians should be aware before they reach for the scalpel. Certain approaches to debridement are used more rarely, according to experts. Autolytic debridement essentially involves keeping the wound covered and moist, and letting the body’s scavengers—e.g., mast cells—absorb exudate and other wound by-products. A lot of these decisions come down to the medical status of the patient, agreed John Steinberg, DPM, an associate professor in the Department of Plastic Surgery at the Georgetown University School of Medicine in Washington, DC. In other cases, clinicians may find value in either enzymatic or biological debridement. According to Wu, the maggots have enzymes in their saliva that are particularly suited to breaking down necrotic and tough fibrotic tissue. The helpful crawlers’ saliva also carries antimicrobial enzymes, and their gut enzymes further break down dead tissue and destroy bacteria. A recent innovation, so far used mainly in Europe, aims to contain both the “ick” factor and its cause by keeping the maggots in a permeable bag instead of giving them direct access to the wound. Wu nevertheless favors the free-range approach. Some products and procedures are proving to be useful adjuncts to debridement—particularly biogels, artificial skin products, and negative pressure wound therapy (NPWT, also known as vacuum assisted closure, or VAC). Robert Kirsner agreed, with a caveat. But again, as the clinicians interviewed by LER emphasized, all of these benefits depend on excellent debridement first. Recent investigations into biofilms—biochemical barriers composed of an extrapolysaccharide matrix within the wound bed that shield bacteria from the attacks of the immune system and exogenous antibiotics3—may give debridement a new role, experts say. Armstrong said that awareness of biofilms may ultimately lead clinicians to a more holistic appraisal of wound bed ecology that treats wounds as the complicated neighborhoods they are. 1. Wild S, Roglic G, Green A, et al. Global prevalence of diabetes: estimates for the year 2000 and projections for 2030. Diabetes Care 2004;27(5):1047-1053. 2. Consensus Development Conference on Diabetic Foot Wound Care: 7-8 April 1999, Boston, Massachusetts. American Diabetes Association. Diabetes Care 1999;22(8):1354-1360. 3. Gordon KA, Lebrun EA, Tomic-Canic M, Kirsner RS. The role of surgical debridement in healing of diabetic foot ulcers. Skinmed 2012;10(1):24-26. 4. Lebrun E, Tomic-Canic M, Kirsner RS. The role of surgical debridement in healing of diabetic foot ulcers. Wound Repair Regen 2010;18(5):433-438. 5. Steed DL, Donohoe D, Webster MW, Lindsley L. Effect of extensive debridement and treatment on the healing of diabetic foot ulcers. Diabetic Ulcer Study Group. J Am Coll Surg 1996;183(1):61-64. 6. Piaggesi A, Schipani E, Campi F, et al. Conservative surgical approach versus nonsurgical management for diabetic neuropathic foot ulcers: a randomized trial. Diabet Med 1998;15(5):412-417. 7. Piaggesi A, Vicava P, Rizzo L, et al. Semiquantitative analysis of the histopathological features of the neuropathic foot ulcer: effects of pressure relief. Diabetes Care 2003;26(11):3123-3128. 8. Saap LJ, Falanga V. Debridement performance index and its correlation with complete closure of diabetic foot ulcers. Wound Repair Regen 2002;10(6):354-359. 9. Cardinal M, Eisenbud DE, Armstrong DG, et al. Serial surgical debridement: a retrospective study on clinical outcomes in chronic lower extremity wounds. Wound Repair Regen 2009;17(3):306-311. 10. Armstrong DG, Nguyen HC. Improvement in healing with aggressive edema reduction after debridement of foot infection in persons with diabetes. Arch Surg 2000;135(12):1405-1409. 11. Armstrong DG, Lavery LA, Vazquez JR, et al. How and why to surgically debride neuropathic diabetic foot wounds. J Am Podiatr Med Assoc 2002;92(7):402-404. 12. Lipsky BA, Berendt AR, Cornia PB, et al. 2012 Infectious Diseases Society of America clinical practice guideline for the diagnosis and treatment of diabetic foot infections. Clin Infect Dis 2012;54(12):e132-e173. 13. Wu S. Debridement and the current state of play. Podiatry Management. In press. 14. Herberger K, Franzke N, Blome C, et al. Efficacy, tolerability and patient benefit of the ultrasound-assisted wound treatment versus surgical debridement: a randomized clinical study. Dermatology 2011;222(3):244-249. 15. Ennis WJ, Foremann P, Mozen N, et al. Ultrasound therapy for recalcitrant diabetic foot ulcers: results of a randomized, double-blind, controlled, multicenter study. Ostomy Wound Manage 2005;51(8):24-39. 16. Tan J, Abisi S, Smith A, Burnand KG. A painless method of ultrasonically assisted debridement of chronic leg ulcers: a pilot study. Eur J Vasc Endovasc Surg 2007;33(2):234-238. 17. Voigt J, Wendelken M, Driver V, Alvarez OM. Low-frequency ultrasound as an adjunct therapy for chronic wound healing: a systematic review of the literature and meta-analysis of eight randomized controlled trials. Int J Low Extrem Wounds 2011;10(4):190-199. 18. Caputo WJ, Beggs DJ, DeFede JL, et al. A prospective randomized controlled clinical trial comparing hydrosurgery debridement with conventional surgical debridement and lower extremity ulcers. Int Wound J 2008;5(2):288-294. 19. Granick MS, Posnett J, Jacoby M, et al. Efficacy and cost-effectiveness of a high-powered parallel waterjet for wound debridement. Wound Repair Regen 2006;14(4):394-397. 20. McCardle JE. Versajet hydroscalpel: treatment of diabetic foot ulceration. Br J Nurs 2006;15(15):S12-S17. 21. Boyd JI 3rd, Wongworawat MD. High-pressure pulsatile lavage causes soft tissue damage. Clin Orthop Relat Res 2004;(427):13-17. 22. Andros G, Armstrong DG, Attinger CE, et al. Consensus statement on negative pressure wound therapy (V.A.C. Therapy) for the management of diabetic foot wounds. Ostomy Wound Manage 2006;(Suppl):1-32. 23. Bahr S, Mustafi N, Piatkowski A, et al. Clinical efficacy of a new monofilament fibre-containing wound debridement product. J Wound Care 2011;20(5):242-248. 24. Armstrong DG, Salas P, Short B, et al. Maggot therapy in “lower-extremity hospice” wound care: fewer amputations and more antibiotic-free days. J Am Podiatr Med Assoc 2005;95(3):254-257. 25. Gilead L, Mumcuoglu KY, Ingber A. The use of maggot debridement therapy in the treatment of chronic wounds and hospitalized in ambulatory patients. J Wound Care 2012;21(2):78-85. 26. Chan DC, Fong DH, Leung JY, et al. Maggot debridement therapy in chronic wound care. Hong Kong Med J 2007;13(5):382-386. 27. Steenvoorde P, Budding T, Oskam J. Determining pain levels in patients treated with maggot debridement therapy. J Wound Care 2005;14(10):485-488. 28. Sherman RA. Maggot therapy for treating diabetic foot ulcers unresponsive to conventional therapy. Diabetes Care 2003;26(2):446-451. 29. Edwards J, Stapley S. Debridement of diabetic foot ulcers. Cochrane Database Sys Rev 2010;(1):CD003556. 30. Blume PA, Walters J, Payne W, et al. Comparison of negative pressure wound therapy using vacuum-assisted closure with advanced moist wound therapy in the treatment of diabetic foot ulcers: a multi-center randomized controlled trial. Diabetes Care 2008;31(4):631-636. 31. Eginton MT, Brown KR, Seabrook GR, et al. 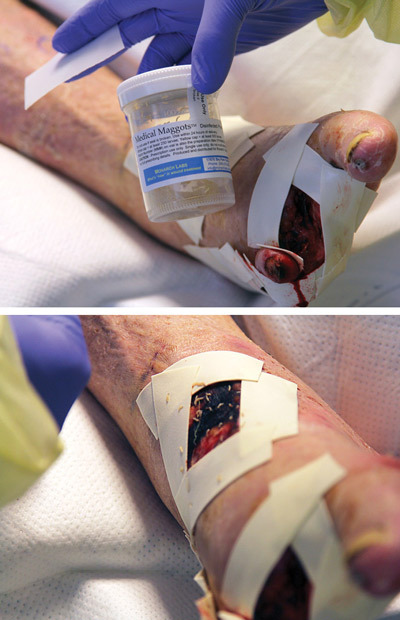 A prospective randomized evaluation of negative-pressure wound dressings for diabetic foot wounds. Ann Vasc Surg 2003;17(6):645-649. 32. Braakenburg A, Obdeijn MC, Feitz R, et al. The clinical efficacy and cost-effectiveness of the vacuum-assisted closure technique in the management of acute and chronic wounds: a randomized controlled trial. Plast Reconstr Surg 2006;118(2):390-397. 33. Armstrong DG, Lavery LA, Abu-Rumman P, et al. Outcomes of subatsmospheric pressure dressing therapy on wounds of the diabetic foot. Ostomy Wound Manage 2002;48(4):64-68. 34. Kim PJ, Steinberg JS. Wound care: biofilm and its impact on the latest treatment modalities for ulcerations of the diabetic foot. Semin Vasc Surg 2012;25(2):70-74.